Tank top season is upon us, so hiding jiggly arms under bulky sweaters is no longer an option. Tone and tighten your triceps with these easy moves that will have you out of hiding before you know it. Tricep dips – You can do this exercise virtually anywhere, on the floor, on a workout bench or chair. Here’s how using a chair: sit in a sturdy chair with your palms flat, knuckles facing forward and fingers curled around the bottom of the chair. Slide your bottom so that it is hovering just in front of the chair. Now lower your bottom and then use your arms to lift yourself back to the starting position. You will look somewhat like you are doing a backward seated push-up. Go for three sets of ten. Uneven plank – the plank is a great overall exercise that is good for the total body. It can help you tone your triceps, too. Get into position as if you were going to do push-ups. Instead of placing both palms flat on the floor, place only one palm flat on the floor. The other arm should be resting flat from elbow to hand. Hold for 15 to 60 seconds . Switch arms and repeat. Go for two reps. Add push-ups in between if you can. 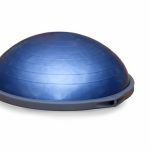 Stability ball push-ups – Place the top of your feet and toes on the stability ball. Your hands should be palms down on the floor. Do push ups as you normally would, bending your elbows to a 90 degree angle. Hold for a moment and slow extend arms fully. Repeat 10 to 15 times. Need a good use of time while waiting for the microwave? Do some wall push ups. Tricep extension – Stand comfortably with your back straight. Grasp a 3 to 8 pound weight (combine two if you need to) in both hands with arms fully extended above your head. Now bend your elbows at a 90 degree angle so that the weight moves toward your shoulders blades. Extend your arms and repeat 10 to 15 times. Arm circles – Stand comfortably with knees slightly bent. Extend both arms out toward your sides and hold hands in a loose fits. Move arms forward in small circular motions and then back using the same motion. Try to do three one minute sets. Downward dog – this yoga pose is good for more than calming the mind. It also tones the triceps. In downward dog your body forms an upside down feet. Place your feet as flat on the floor as you can. You palms should be flat on the floor as well. Keep your spine straight and your neck in line with your spine. Your bottom should be positioned as the point of the V. Hold for 30 to 60 seconds. Add these exercises to your routine at least three times each week and you will notice more tone in about a month. Hello strappy tops and goodbye cover-ups!